Glisten up people har har … Every time I turn around I see a new and exciting use for loose glitter. Did you read this NY Times article on glittery eyes? I mean, get behind Glitter on Everything <- it’s the new thing. It’s also TODAY’S #GIVEAWAY. CONTEST OVER THANKS FOR PLAYING! This week, you can win my hand-picked glitter “kit” from tre Bellezza - retail value $98. 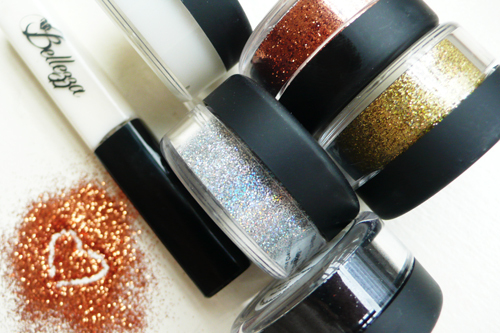 This cult brand has a great range of fine metallic glitters. If you’re wondering what you’re going to do with this stuff except dust it in your hair (great idea though - you can) … it’s safe for eyes and lips, and they make this amazing Stick It Glue and sticky balm called Liptastic which you can use with any glitter or pigment. Stuff works great, so fun. You can also do a nail look with it (here’s a good loose glitter nail tutorial). Contest ends next Friday January 20th, 2012 at 11.59pm Eastern. If you subscribe or follow to enter, you must be subscribed or following at the time of the drawing. Multiple comments DO NOT increase your chances of winning but love ya. Winner is drawn at random. Also - write this down - you can use my promo code PRETTY for 15% off their collections valid through 1/31/12!